New Zealand Prime Minister Jacinda Ardern led thousands of mourners gathered at a park in front of the Al Noor Mosque, where most of the victims died, for a prayer followed by two minutes of silence. The Azaan, The Muslim call to prayer, was heard across New Zealand on Friday, as thousands gathered to remember the 50 people martyred by a lone gunman at two mosques a week ago. 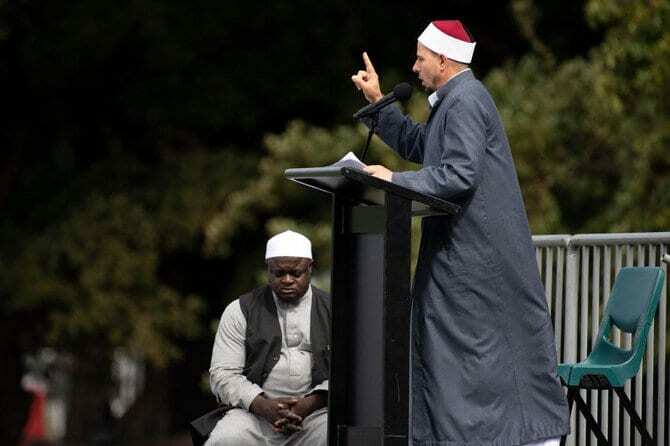 The Imam, Gamal Fouda of Masjid Al Noor, who survived the attack last week, has led the first Jummah prayer in Christchurch since the mosque shootings last Friday. Fouda warned against the “evil ideology of white supremacy” saying it was a threat to mankind globally. Jacinda Ardern, announced a ban on military-style semi-automatic and assault rifles under tough new gun laws on Thursday. The prime minister was accompanied in the Christchurch prayers with community leaders and other foreign dignitaries. The Azaan was broadcasted nationally across all free-to-air TV and radio stations. “Thank you for your tears. Thank you for your haka. Thank you for your flowers. Thank you for your love and compassion. To our prime minister, thank you. Thank you for your leadership. It has been a lesson for the world’s leaders. Thank you for honouring us with a simple scarf,” he said.